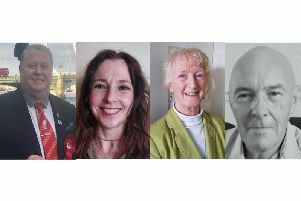 South Tyneside local elections: Who will get your vote in Monkton? Candidates in the Monkton ward for the local elections, from left, Joan Keegan, Jack McGlen and Oliver Wallhead. Not pictured: Vikki Lawlor. There’s less than a week to go until South Tyneside goes to the polls for the latest local elections. Here’s why the candidates in the Monkton ward think they deserve your vote. I am married with two children and five grandchildren and I’ve lived in the Monkton ward for 45 years. I am a member of the Local Doctors’ Patient Panel and a registered member of the Newcastle Hospitals Trust. Through my voluntary work, I accompany people to various hospital appointments and to warfare rights and benefit offices. I am passionate about social justice and concerned about how Government decisions have a detrimental impact on the people in South Tyneside. No words or picture supplied. I am proud to represent the Green Party in Monkton ward. New to South Tyneside, my fiancé and I moved into our first home in Jarrow this time last year. I have been an active in the Green Party for five years. My priority in politics is to oppose the counterproductive and cruel cuts the Tories are imposing. This would remain my priority if elected. The NHS is a precious resource and I am particularly appalled by cuts to local services, along with the government’s treatment of junior doctors and student nurses. Vote Green in 2016 to bring fresh, fair voices to your council. As the Conservative councillor elect for Monkton ward, I look forward to working with all of my fellow councillors on behalf of the people of Monkton. Having been born and raised in my home town of South Shields, the concerns and wishes of the residents of South Tyneside matter a great deal to me. I wish to put myself forward to address the issues that matter to local residents, and to be their representative on the council. I will forever endeavour while in office as your councillor to repay the trust the local residents have endowed me with to improve their local communities, for the betterment of all residents. It is my intention to be open and always available to help Monkton residents in anyway that I can. I look forward to meeting and hearing from you all.